» Texas Chainsaw Massacre 2 Lights! Camera! Vegan! 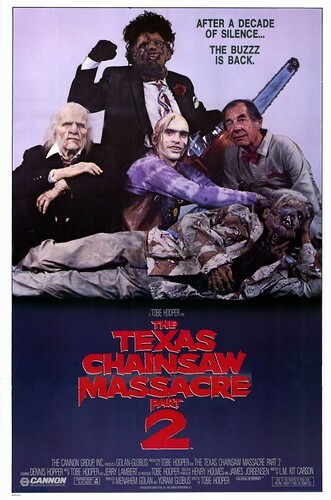 Everyone knows that the original Texas Chainsaw Massacre is a classic horror film, but what about the sequel? I consider it an enjoyable movie, much sillier than the first and pretty gross. I think the Breakfast Club movie poster spoof is an obvious indication that this movie was supposed to be more campy than the original. Last year, I watched it with a group of people who had never seen it before…and none of them liked it! They all said it was horrible. I will say that this movie is the only sequel that follows the timeline of the original, it has John Siedow (the cook) from the original, and it is also directed by Tobe Hooper. So unlike some sequels that have nothing to do with their original film, this one has a lot of ties and I think that alone makes it worth watching. No matter if it seems good or bad, I always want to see where a sequel will take the story of a movie I really like. Not only does this movie have Bill Mosley (Otis from Devil’s Rejects) at the beginning of his long horror movie career, but Dennis motherloving Hopper plays a grief-crazed uncle hellbent on revenge! Makeup effects by Tom Savini are also a bonus. If you don’t want to watch the movie, you can just listen to this awesome song by the biggest local band my town has ever had. Entree: In this movie, Drayton Sawyer is famous for his chili. Texas chili is special though, no beans allowed! Side: Who wants to eat chili without cornbread? I find most cornbread recipes too dry, so when I discovered corn spoon bread (recipe below), I was in love. Dessert: I’ve never been to Texas, but I remember one of my mom’s friends was always bringing Texas Sheet Cake to get-togethers (I think she just used german chocolate frosting from a can, but whatevs). This recipe is from one of my zines, which is no longer in print. This is a veganized and modified version of a recipe I found years ago. I hate most cornbreads because I find them too dry. But this bread is dense, extremely moist, and flavorful. I used to put whole kernel corn in it as well, but about half of the people who ate it that way didn’t like it, so i’ve omitted it from the recipe. But if you really love corn, go ahead and add it in. I don’t go through things like vegan mayo or sour cream very fast, so this is a good way to use things like that up. Preheat the oven to 400 degrees. Lightly grease a square nonstick baking pan (or a muffin pan). In a large bowl, sift together the flour, cornmeal, baking powder, and salt. In a smaller bowl, whisk together the rice milk, canola oil, maple syrup and sour cream (it’s okay if the sour cream is a little lumpy). Add the wet ingredients into the dry. Add the creamed corn and gently mix until just combined. Pour the batter into the pre-greased pan, and bake in the oven for twenty minutes or until a toothpick inserted into the middle of the bread comes out cleanish. This is a spoon bread so it’s not supposed to be completely dry, but the center shouldn’t be liquidy at all. If making muffins, check after ten minutes.